I discover I have the day off and decide -- what else?! 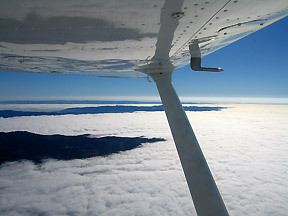 -- to get up really early and fly to Monterey (KMRY) and back in 2SP. Pretend freightdogging, really, especially the getting up early bit. All in search of actual, and, well, fun -- and to make up for Wednesday's failed attempt. 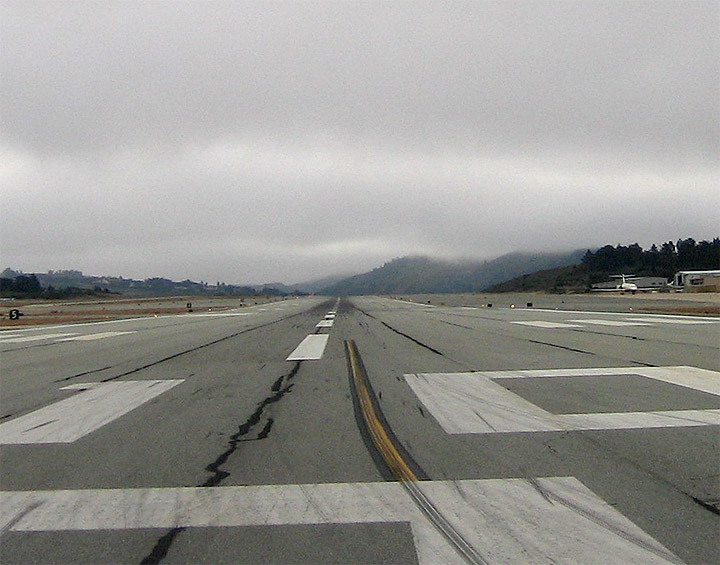 NUEVO5.SHOEY MUNSO -- the Usual, with the ILS 10R at Monterey, and TORO5.SNS PXN SUNOL / ILS 27R return to Oakland. Nothing I haven't done before. This time, though, there's widespread coastal stratus from about 600' up to 2,500 or so, and I'm guaranteed real IMC departures at both ends as well as a real need for the ILS in to each airport. Cool! Things don't start so well. I can cope with the earliness (with the help of coffee from Javarama), but when the fuel pump at Kaiser spends several minutes printing my fuel receipt one character to a line, double spaced (I still have the three-metre-long receipt in my flight bag), and then the Kaiser person on the desk gets my written receipt wrong twice in a row, and then tower tells me I'm number five for release ("expect about a fifteen to twenty minute delay") as I sit there just off 27R, I realise this is probably going to be One Of Those Days. I sit there thinking it's a good thing it's cold and grey out there and I'm not literally stewing in the cockpit... I depart 45 minutes later than expected. So much for being early. But the rest of the flight actually goes well, and I get quite a lot more actual IMC than I'd expected (ATC keeps me low and in the clouds longer than usual on both departures). 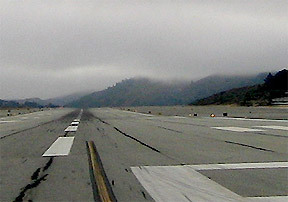 Not much to report about the actual flights themselves except that the stress levels on the ILS into Monterey -- my first real IMC single pilot approach to near minimums (600' MSL breakout for 440' MSL minimums) -- are much higher than I expect, even though it's an unremarkable vectors-to-final approach. 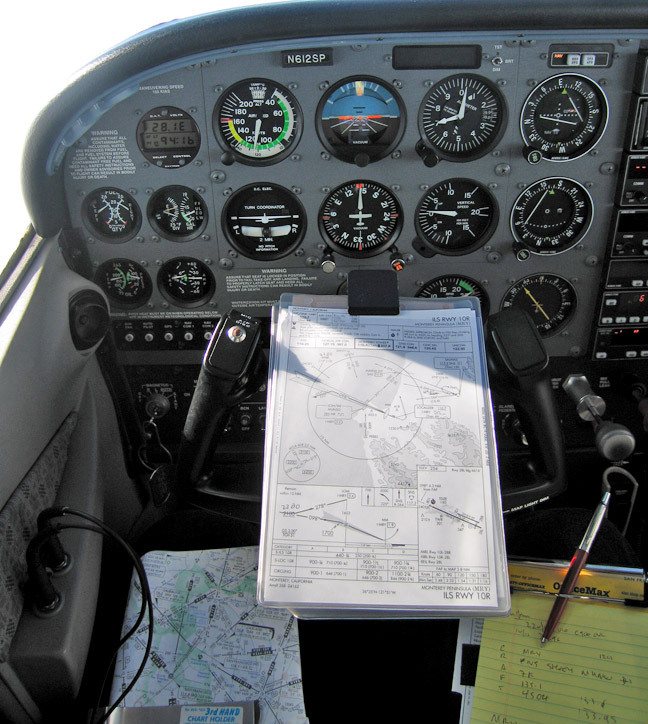 It feels great to break out still in "the donut" at a little under 600', the runway dead ahead, but single-pilot approaches in solid IMC have to be the most stressful thing I do at the moment, even worse than the drive down Interstate 880 each day. The ILS back into 27R, by contrast, is a relatively familiar exercise despite having to keep the usual best forward speed, and breakout comes at about 800' into light drizzle. 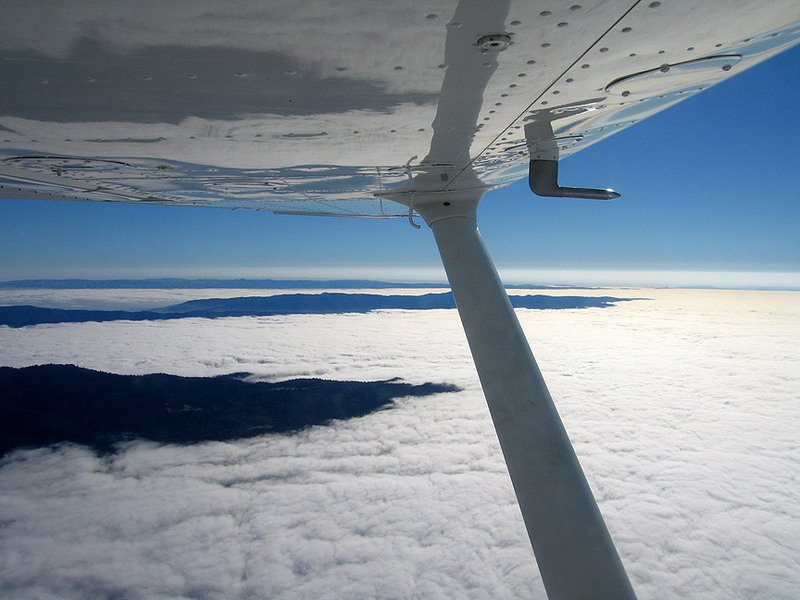 As always, sinking into the cloud layer on the approaches is just breathtaking -- but of course that's exactly the time you should be most concentrating on transitioning to instruments, and not looking around, and the approach into Monterey is momentarily destabilized as I forget this obvious fact (another good lesson...). I use the autopilot this trip for the enroute portions only -- I want to keep my actual approach flying from getting rusty -- but as always, it's good to know it's there if I need it on the approaches. 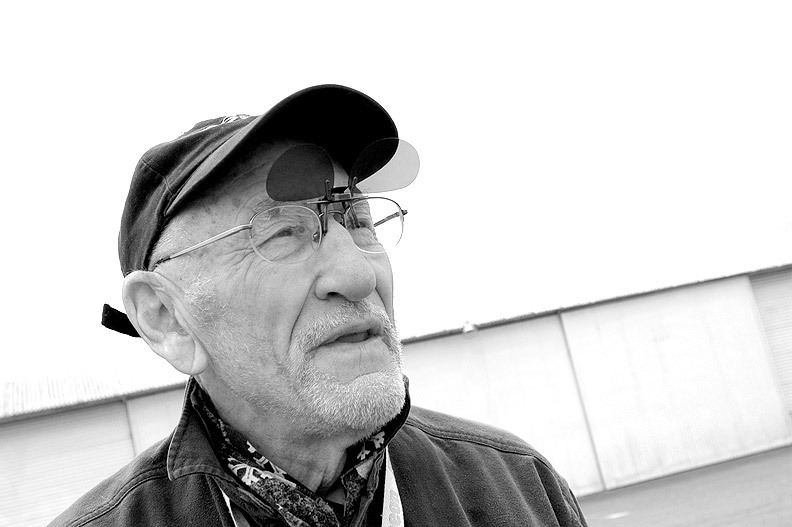 While tying 2SP down at the club I hear a familiar voice calling me from Lou's hangar. 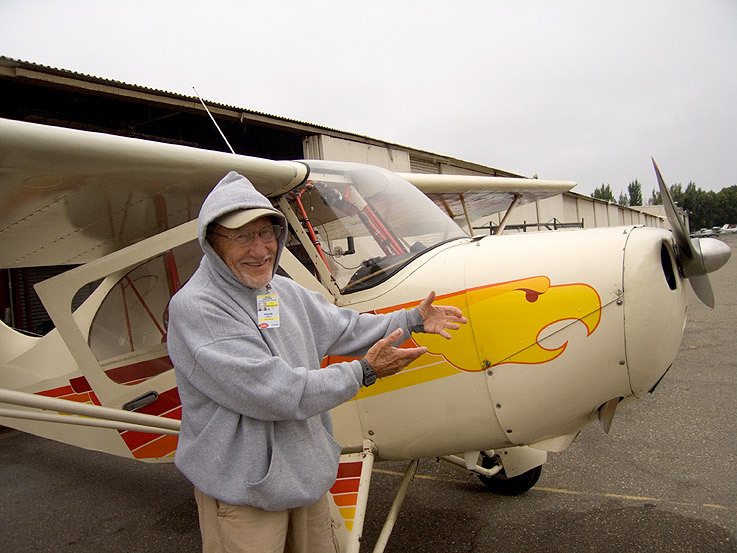 It's Lou himself, dressed up against the cold grey, working on his latest plane, a 1946 Aeronca Champ. He wants to know the real ceilings down past Hayward to see if he can get out beheath it to Livermore. 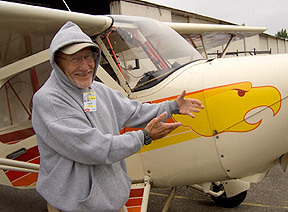 Not likely, I tell him, it's hanging low all the way out to Livermore, and Hayward's reported 800' is a little optimistic right now if you ask me... oh well, he says it'll give him time to do a little more work on his plane. I've never actually seen it close up before -- it's an absolute classic, almost no instruments (the only concession to modernity being the hand-held GPS unit strapped to the internal cockpit bracing -- Lou wouldn't fly anywhere without it), and with a relatively powerful 85HP engine. 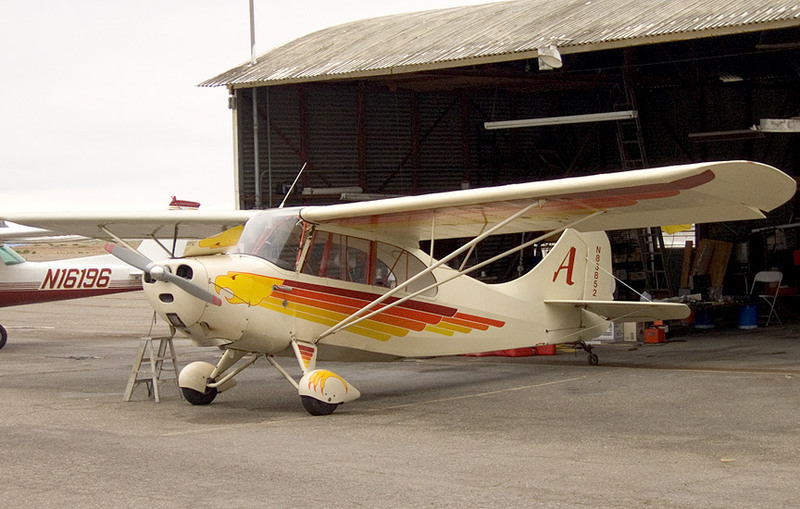 We talk a while about taildraggers and aerobatics, and how much he enjoys the Champ for just pottering about the Bay and out into the Valley. He's started calling it the "Thunderchicken" after the artwork on the side.